On the eastern bank of the Rhône River in southeastern France lies the city of Avignon. Celtic tribes may have founded the city and also established a fort at the site now known as Rocher des Doms, along Avignon’s northern edge. 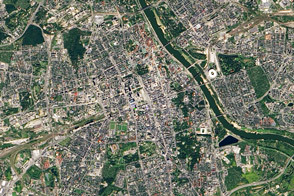 The city did not gain lasting prominence, however, until it became an alternate site for the Roman Catholic papacy (the church government, headed by the pope) in the fourteenth century. The papacy was based at Avignon until 1377, when it returned to Rome. 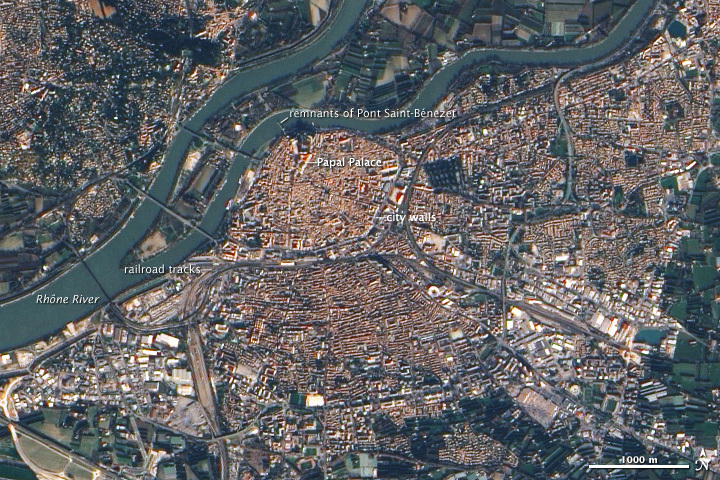 The Advanced Land Imager (ALI) on NASA’s Earth Observing-1 (EO-1) satellite captured this true-color image of Avignon on December 15, 2009. Northeast of Avignon, the blue-green Rhône River branches, but the smaller rivers unite southwest of the city. Centuries-old remains of the Pont Saint-Bénezet, or Saint Bénezet Bridge, partially span the river. Avignon’s central core, immediately east of the river, appears as a rough oval, delineated by medieval walls. Popes residing in Avignon oversaw the walls’ construction, but they built even stronger barriers around the Papal Palace. Inside the city walls and immediately to the south, closely-spaced buildings with brick- or buff-colored roofs predominate. To the southeast and southwest, larger industrial-style buildings appear, often accompanied by lots and open fields. Railway tracks form an uneven inverted U and, at their northernmost point, pass immediately south of Avignon’s old city walls. Roughly 60 kilometers (37 miles) from the Mediterranean Coast, Avignon is part of Provence, and enjoys a Mediterranean climate, with hot summers and mild winters. 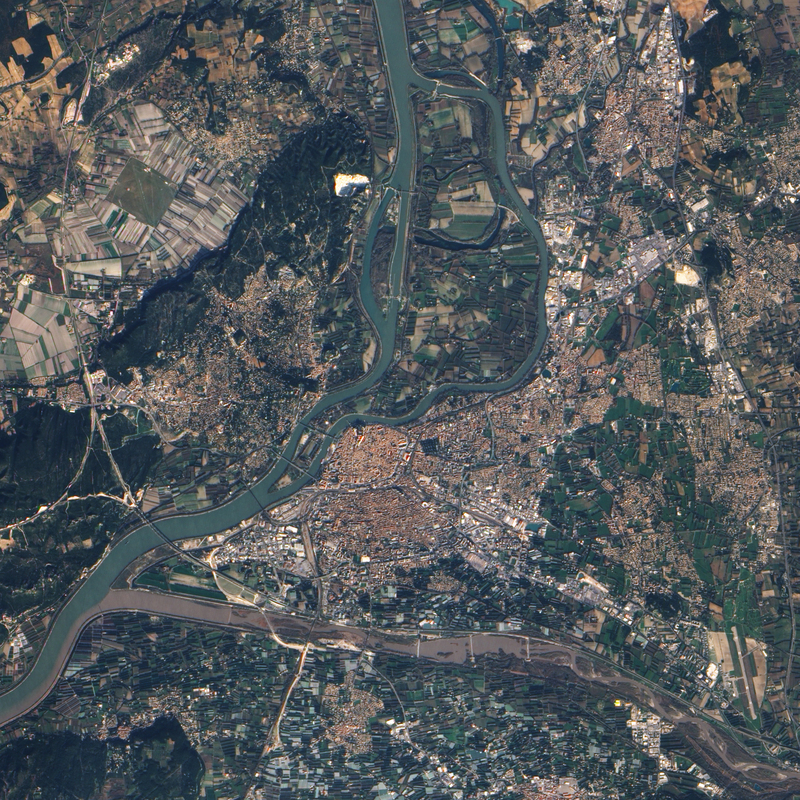 This mid-December shot shows areas of deep green along the city’s margins in the south and east, and more vegetation west of the Rhône River. 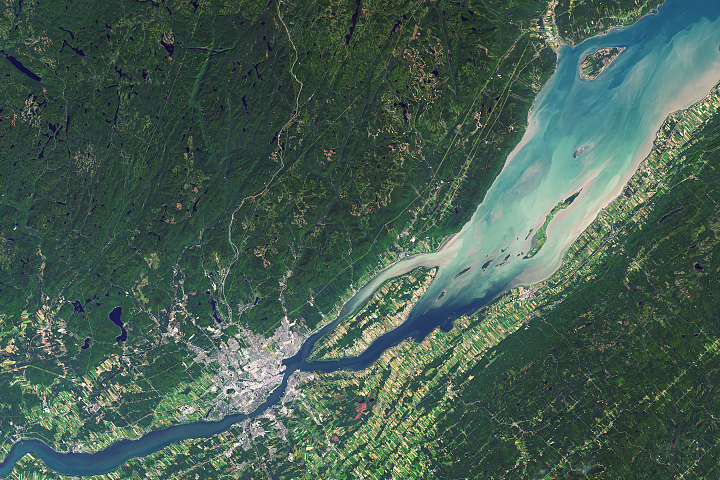 NASA Earth Observatory image created by Jesse Allen, using EO-1 ALI data provided courtesy of the NASA EO-1 team and the United States Geological Survey. Caption by Michon Scott. 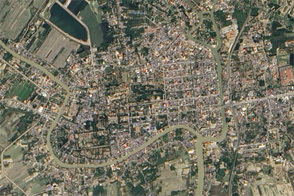 Acquired December 15, 2009, this true-color image shows Avignon, France, immediately east of the Rhône River. Walls surround the city’s historic center. Industrial-style buildings predominate in the southwest and southeast. Avignon Tourisme 2009. History of the Saint Bénezet Bridge. Accessed January 29, 2010. Places Online. Avignon Landmarks and Historic Sites. Accessed January 22, 2010. Wikipedia. (2010, January 17). Avignon. Accessed January 22, 2010. World Travels. Avignon Weather and Climate. Accessed January 22, 2010.